I hope you feel better than you did yesterday. I mean, even if you felt great yesterday, I hope you feel even more better today, but if you didn't feel great, then for sure I hope you're better now. There is something about all the sunshine of summer that gets in my eyes and has me missing the deadlines of a lot of favorite challenges. That's a poetic way of saying, holy crap I'm too late, again! For foliage I turned to this wonderful SU "My Friend" stamp with matching sediment. I just love the serenity of the design. I tried adding sequints or enamel dots to juzz it up a bit, but I found them too distracting and cluttery. I stamped the image away for the edge and then stamped the sediment crosswise. I drew lines on each side of the sediment to give it some faux panel dementia. The coloring was done by markers directly to the stamp, which I then lightly spritzed with water before stamping. Because the paper is not watercolor paper and because it has a slight shiny coat, the colors have a muted effect. To bring back the depth, I outlined the image with a fine-point Sharpie. I love doing "All-Purpose" cards like this that I can turn into any conceivable need for a card. For a friend, of course, seeing as how that's what it says. 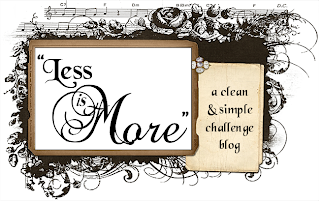 You still have a bit of time to join in the fun at Less Is More. 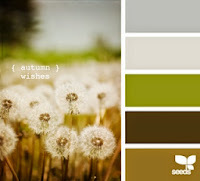 I'm also linking up with this color scheme over at One-Layer Simplicity Challenge "Shades of Summer." You can click on the links to find the details about rules, sponsors, and prizes. It was so easy to do and it's been easy to care for in our severe drought conditions. I hope you are able to read it when you click on it and enlarge it. I couldn't get it to expand any further. I should just warn you that our trusty computer is crashing quite a bit and my in-home IT guy says it's time for a new one. So two things: a) I may be on less because I have trouble with car pool tunnel when I use the laptop too much; and b) can I come and stay with you for a few days during installation? I think you know what I mean. The Playhouse is not far enough away. You wall is beautiful. What a lovely idea. Beautiful foliage both on your card and in your garden! Clearly both have benefitted from your love and care! You never cease to amaze me with your cards! Beautiful...I love the sentiment going up the card! What a fun wall of succulents! First of all, your wall of succulents is very lovely and looks so cool!! I am so impressed because I can't grow anything!! Your card is a beautiful one, one that any friend, on any occasion would feel blessed by!! I love the soft, glistening feel it has to it!! Superbly done!! Your foliage is gorgeous; your succulents sensational; your 'life with the Mister' stinkin' hilarious! Love this post! My life with my *mister* would read pretty much the same, except his diary would include "Can't figure out why my bike's don't work." Hahahahaha...you're awesome! I already feel better after looking at your card! Delightful and beautiful! Love the wall garden too.....looking pretty spiffy. 1)I understand missing deadlines. Do it all the time. Think it's amazing you managed to meet 3. 2)LOVE that succulent garden.Since drought seems to be the operative word, I have to rethink my garden and you've given me some good ideas. 3)Men are enigmatic. Women overthink everything. 4)Yes, I know I said three, computers piss me off. Love your beautiful succulent garden, and the little his and her piece is hilarious -- probably because it's so typical! LOL at that his diary her diary so true at times. Beautiful card...thank you for your great detailed esplanation as to how you made your card. Your Garden wall is Lovely...Great job. Beautiful card - oozes serenity! Love the succulent wall too - what a great idea! Good luck with the IT! Gorgeous classy card, love the stamp and your layout. Great idea for the garden wall and no bending. Ah, I wish you could come and stay here, my mister is away for a few days on a walking trip....I imagine there will be the odd drink too...lol. OMG! Men truly are from Mars and women are from Venus! Your diary entry proves it! ROFLMAO!!! That's a good one! Love that pretty card as well as your beautiful hanging garden! * your succulent garden belongs to a magazine! simply amazing! I dream of having a succulent garden, ain't gonna happen in Chi-Town! * thank you for your comment, you made my day! * i hope you don't have to replace your computer! Such a pretty card! And YAY! for making it in time! ;) Love your succulent garden...very nice! And once again, a good laugh with the his and her dairy! ;) Thanks for sharing! You're so right about the serenity of this card Dippy ...... it's lovely. As is your succulent garden/wall....how it's grown in three months. Love the "my life with Mister" how true is that! As always you brighten my day. Your card is stunning Darnell. I love the way you have coloured the image and fabulous design. I can really relate to The Diary article! Yes, I have had a better day than yesterday. My youngest daughter has had a wonderful birthday today and my eldest daughter found out that she did exceptionally well in her exams and can now go the the University of her choice! So we are all happy here! What a gorgeous stamp and I love what you have done with it. Also love the life with Mr story. Soooooo funny. I love how you added non layers to this card, Darnell! The foliage is so soft and pretty and you have lots of friends that this card can be used for! Come on over during installation. The way you have added the colour to this image is just tremendous Darnell... is it pointillism or something, it looks tremendoso! Your garden wall is pretty splendiferous too! I hate it when you have to set up a new computer; the last time I upgraded a few months ago I paid the folks in the computer shop to transfer all my files and add my email accounts and all that jazz and it helped enormously! Hi Darnell, this card is stunning, I love the subtle colours and your design, the sentiment looks fantastic on the side. Gorgeous card there Missey. Loving your succulent wall. I wonder if that is what I should do as I aint very good with the green things! As for the diary thing...that could be mine, but substitute motorbike for car!!! Tee hee. Spare comfy bed with ensuite craft room is available in return for garden duties. New computer...eeekkkk...I've crossed everything humanly possible in the hopes that the process is easy and not a nightmare! I've never tried painting straight onto my stamps. It looks amazing on your card and such a genius idea to go around the outline with your pen, really makes it pop. Watching plants grow is so cool, especially when you have photos. I remember in Spring last year taking photos of our garden before we went away for 10 days. It was blah and wintery. When we got home all the blossoms were coming out and my dogwoods were flowering..it looked incredible. Your succulents must be loving themselves on that wall because they have grown alot. Must be all that wonderful summer sunshine....so jealous!! Love your card...wowzer...that one layer card packs a gorgeous punch. You always make me smile...and for that you always always make my day better. Completely love the life with my mister...and oh sister, we just got a new computer...very painful but worth it after returning one that didn't work...it was worth it! Love the simplicity of your pretty card Darnell and the soothing colours are just right. I'm still chuckling over the diary entries - we can be such drama Queens it's no wonder men have trouble understanding us! Good luck with the computer. Ahhh Darnell, where do I start. Ok I love your card, so simple yet eye catching. In the photo I got the impression of shimmer in the ink then realised its just old eyes seeing the ink differently. Love your succulent (cant spell for peanutssome days) garden. The little bits of colour. I am famous at our garden centre for having 'black thumb'. I dont know why but nothing survives my help so I just let whatever wants to grow grow and enjoy other peoples gardens. The only truly beautiful thing in my garden is a frangepani tree that has managed to survive even me and blooms bigger and more beautiful each year. But of course itswinter now so just a scarcrow. Loved that diary exert, dont we females always do that, ohh so over thought. And to the last and having the computer IT living in my house I know exactly where you are coming from. I always tried very hard to make sure I had work on when the computer needed work on it. The ranting was enough to make me want to leave home every time. Hey Miss Darnell, that certainly is a gorgeous, brilliantly designed card, and your right perfect for anything, imagine it you met all the deadlines, your already the Queen of them. Your wall is so succulently beautiful funny story, makes me kinda glad I'm single hahahha. Hey you could come over to mine anytime we would have a huge crating party and have some big fun....Enjoy your day! No seriously EH!!! hope you have a lovely weekend and good luck with your computer, I'm still having trouble with my new server computers gggrrr.. ((( BIG HUGS ))). I feel better just seeing your beautiful card and seeing your lovely succulents! I love the neutral colors you chose for the foliage and that you kept it clean and classic...so pretty! Hope you get through your IT issues quickly and that you get it all resolved. Thanks so much for the excerpt, too...men ARE from Mars, that's for sure! The subtle colors look amazing and I so admire the perfection in outlining the stamped image :) superb! Your card is serene, calm, and would work for any occasion. The succulents look wonderful and displayed so nicely. I checked out Hero Arts but that is too far from Mountain View where my kids just moved to. Love your card AND.your succulent garden! will be chuckling about the diary for ages! Your card and your succulent garden are beautiful. That story is too funny. After being married for almost 43 years, I've learned to just let my hubby be when he buttons up. If it's about me, he'll eventually tell me. If it's about somebody/something else, he will probably eventually tell me. Sometimes I don't find out directly. Sometimes I figure it out on my own. But I've learned not to let it bother me. Believe me, I've learned not to sweat the small stuff with him. It's never worth it. That's a lesson I learned over time. This card is gorgeous. Love the look with watercolor and outlining, and that vertical sentiment is perfect. And, that comic is a riot. So very true. Oh, Darnell, you are too funny! Working my way from the bottom up: Hope everything goes well with the installation and you'll still be married afterwards... Of course you could come stay with me on the East Coast, that should be far enough! The fun we would have stamping, etc..!. The pages of you diaries made me chuckle - no, actually only his made me chuckle. It's so true! Your succulent wall is so beautiful! It must make you happy every time you look at it! And your card is so wonderful! Hard to believe that it's a OLC, it has so much dimension! The outlining with a sharpie is brilliant! Darnell what a totally stunning way to colour the foliage - and outlining again is just the icing on the cake. That is a gorgeous card Darnell ! Your fence of planters is fab too !! Love your card!! Your wall garden is awesome! Love reading Your Life with the Mister. Hi Darnell, love the motorcycle story ..... LOL!! Oh GF you always make me laugh. I truly love this card. I love what you did with that stamp! The faux panel is awesome. The diaries are just too funny ... but true, probably. :) Thanks for sharing it all! Hi Darnell! Sorry for visiting you after long, life's been quite busy offlate. Getting little time to craft or blog. I can't decide what's more beautiful, your card or your garden wall. I love that the card has muted colours. It looks lovely. And how organised you are!! Such neat and perfect garden wall! Hope your puter gets fixed soon. I really like how you did your foliage and the whole card is uplifting and simply loving too! I had to share that story with my daughter as she's only been married a year, and these thoughts had entered her mind lol...Isn't it amazing how different men and women think? Beautiful garden wall! We just got our water rationed to watering only three days a week. Our card is beautiful!! I was thinking that I need more "all purpose" cards too! Hi dear friend darnell, I am a wee bit behind in visiting blogposts since I've had an extremely busy week. But here I am now and I love your clean and simple card. Lovely colour too. This is beautiful, Darnell! I have that same stamp set but never thought of doing it sideways like that. Absolutely gorgeous with your coloring. Love it! Love your wall of succulents planters. It looks fantastic. I chuckled at the funny story..still smiling about it as I type! Love the pretty card. The colours you acheived are so lovely. The colour on the leaves is so pretty; it looks a bit metallic. I cant believe you did all that outlining. I thought that was the stamp. I like the sideways sentiment too. I hope that your computer installation is smooth...my husband always had to do that for me but that changed 8 years ago when I got a Mac. Oh no!, now I have jinxed my computer. Feel free to visit Austin if it gets a little too...nerve wracking. Hugs to you and have a great weekend. OH MY GOODNESS...this is just amazing and I love how men and women think so so differently. Thank you for sharing that. Now on to your card, fabulous, simply fabulous! I love your clean and beautiful look you created. What a wonderful tranquil design--love your coloring and the punch the outlining gives it! Your garden wall looks super amazing too. TFS a peek into the diaries--so true. Have a wonderful weekend and best of luck with your computer issues. Thanks for joining the less is more challenge with your stunning foliage card Darnell. That image and colouring is divine. Your card is absolutely stunning, Darnell! What a great wall garden--never tried anything like that. The funny is oh so funny & true!! I'm with you on that "all purpose" thing and this card is perfect for it. The color is so soft and soothing. Your card is beautiful, I love using the marks right on the stamp and then spritzing it ! Wonderful results! love the diary page, I have seen it as my daughter posted it once... its so darn true. They think one way and we the other. Wonderful post Darnell! I loved your beautiful sophisticated card. Your wall of succulents looks like it came out of Martha Stewart "Living" and OMG that "My Life with Mister" cracked me up. I had to call my daughter over to read it too! Wow! I just love one layer cards and this beauty knocks it out of the park. I love how shimmery it is. I mean, how did you do that?! It's amazing! Darnell, I know EXACTLY what you mean about vacating the premises when hubs is doing something, ahem, complicated. Big hugs! Your card is wonderful. Love how you created such a soft and soothing and organic foliage and then the straight lines and crispness of the sentiment with the one vine tendril. The contrast adds so much to this design! Thanks for playing the OLS Challenge again!!! The effect you have created on those leaves is truly gorgeous!! The laughter of my husband and myself over the very appropriate diary entries is continuing. Love how you created the colours on the leaves - so beautiful! So glad you joined us at OLS! Oh my!! First, your card is beautiful. I love the foliage you used and how you placed the sentiment. I also LOVE your succulent garden. What a lovely way to display it!! And your "diary" post-Bwahhaaaaa!! And so true! !